However, neither of these solutions utilizes the .NET or the CLR. 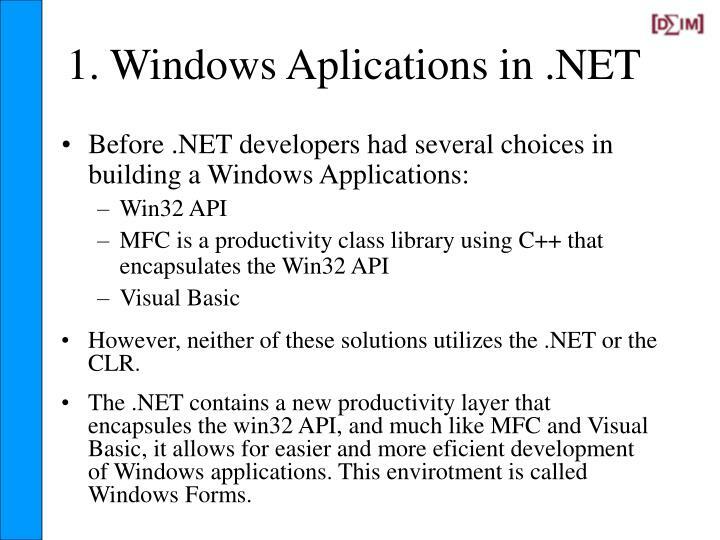 The .NET contains a new productivity layer that encapsules the win32 API, and much like MFC and Visual Basic, it allows for easier and more eficient development of Windows applications. 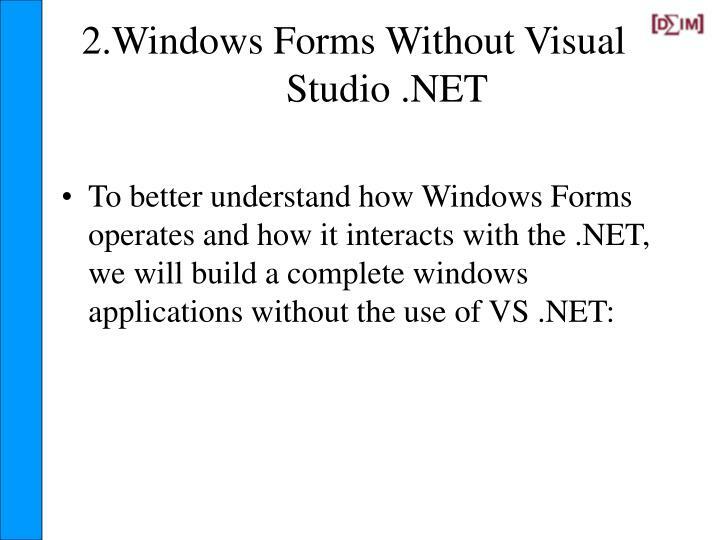 This envirotment is called Windows Forms. 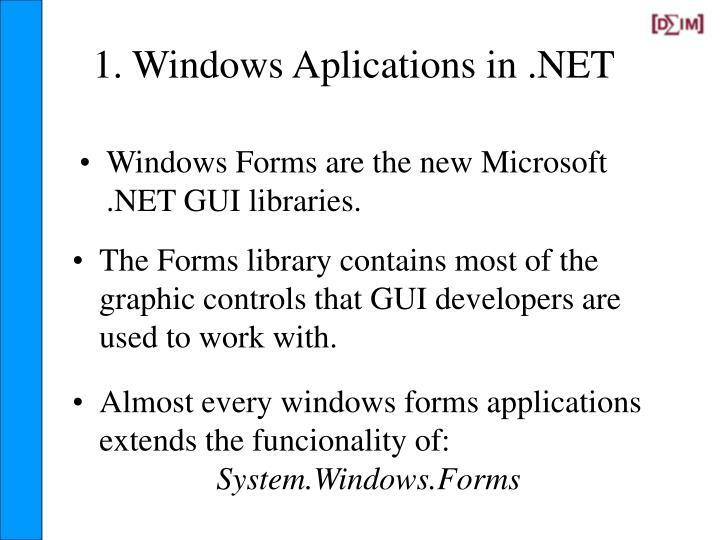 Windows Forms are the new Microsoft .NET GUI libraries. 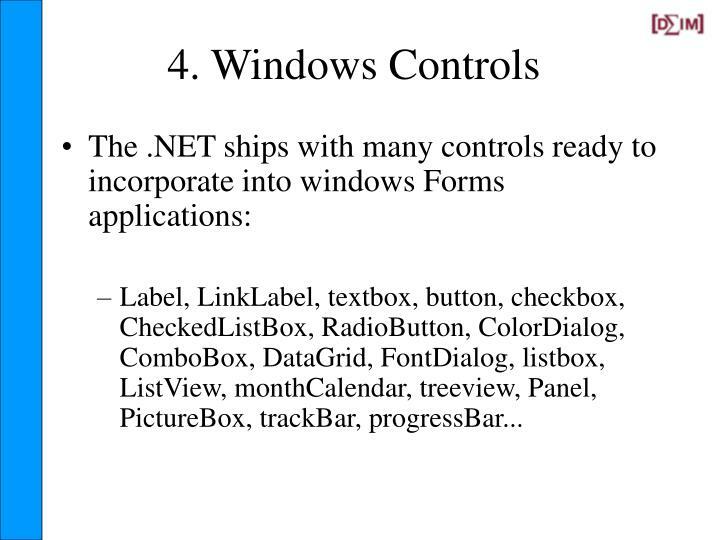 The Forms library contains most of the graphic controls that GUI developers are used to work with. 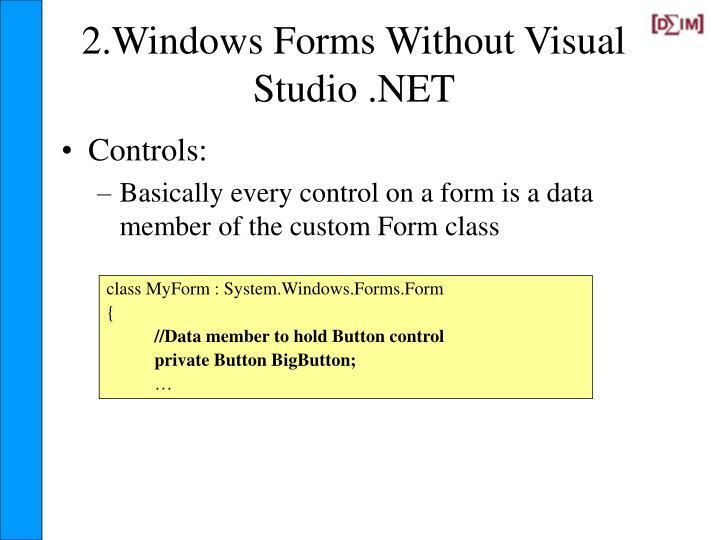 Before this data member will do anything or display a button on the form, it must be initialized and the button’s various properties must be configured. 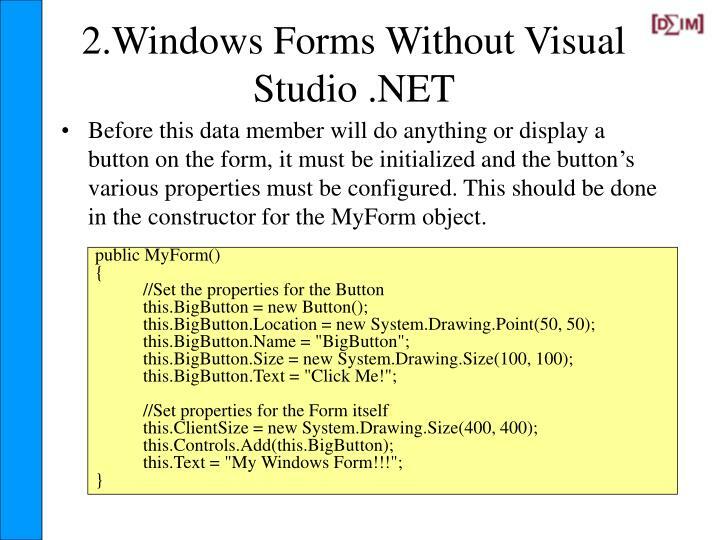 This should be done in the constructor for the MyForm object. 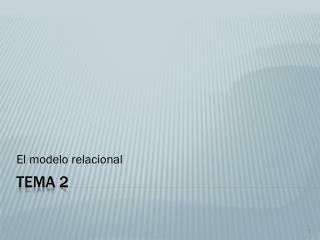 The first parameter contains the object that raised the event. 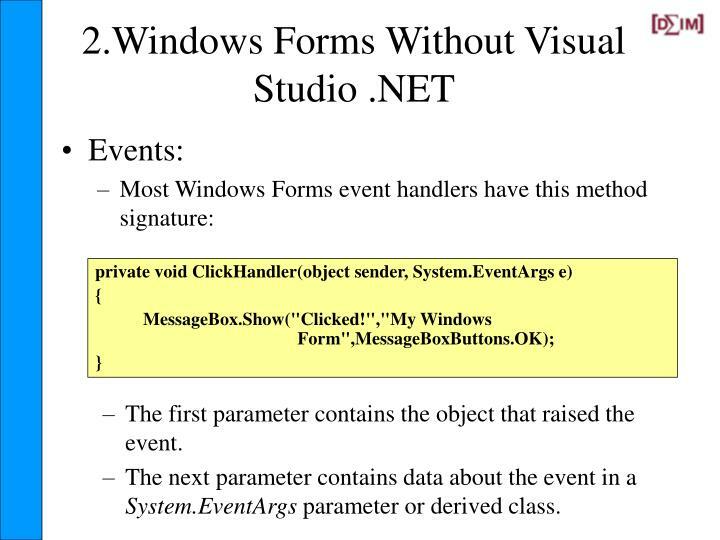 The next parameter contains data about the event in a System.EventArgs parameter or derived class. 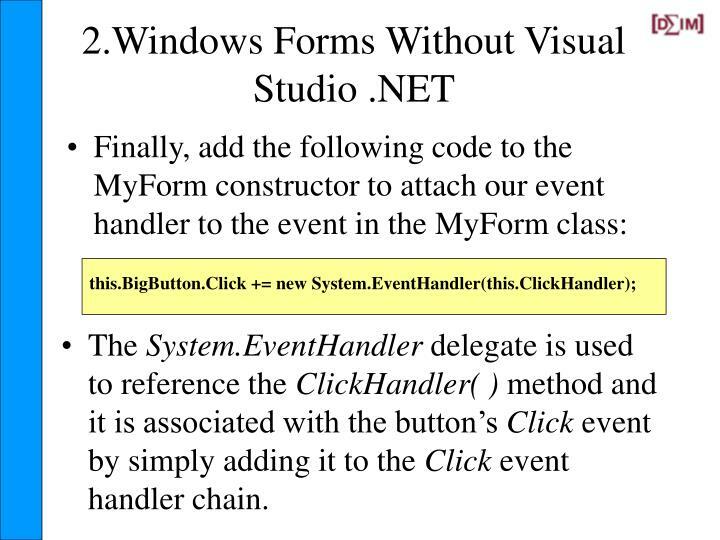 The System.EventHandler delegate is used to reference the ClickHandler( ) method and it is associated with the button’s Click event by simply adding it to the Click event handler chain. 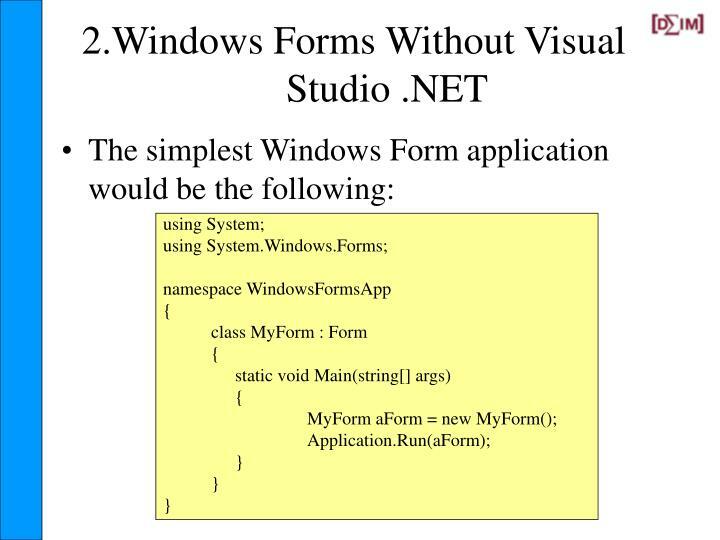 Using Visual Studio .NET makes Windows Forms applications much simpler. 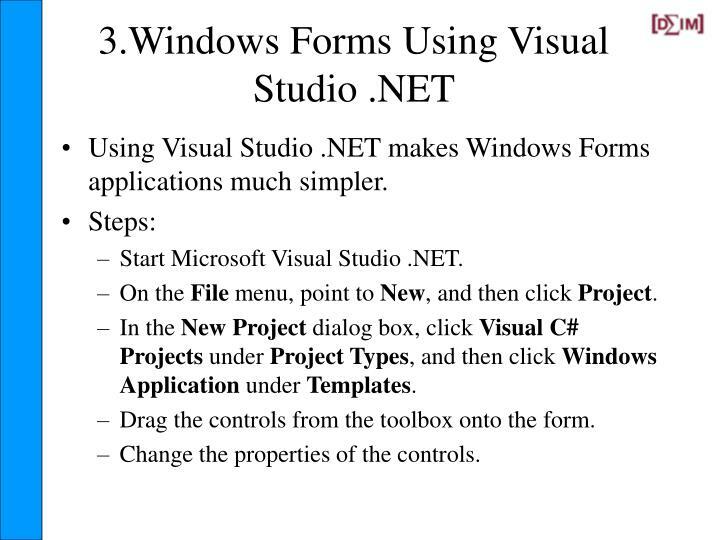 In the New Project dialog box, click Visual C# Projects under Project Types, and then click Windows Application under Templates. Drag the controls from the toolbox onto the form. 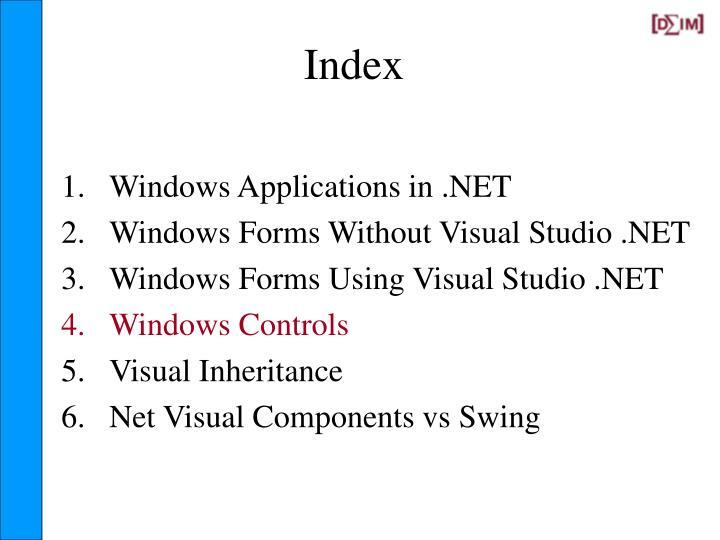 Change the properties of the controls. 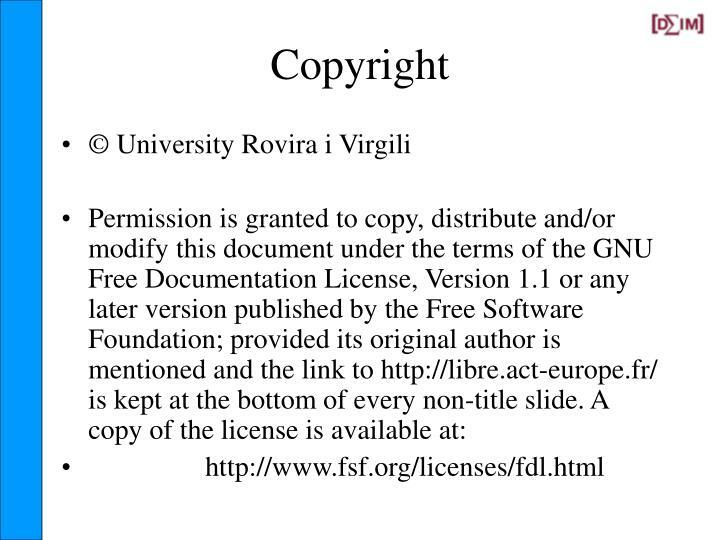 Label:It is used to show static text. 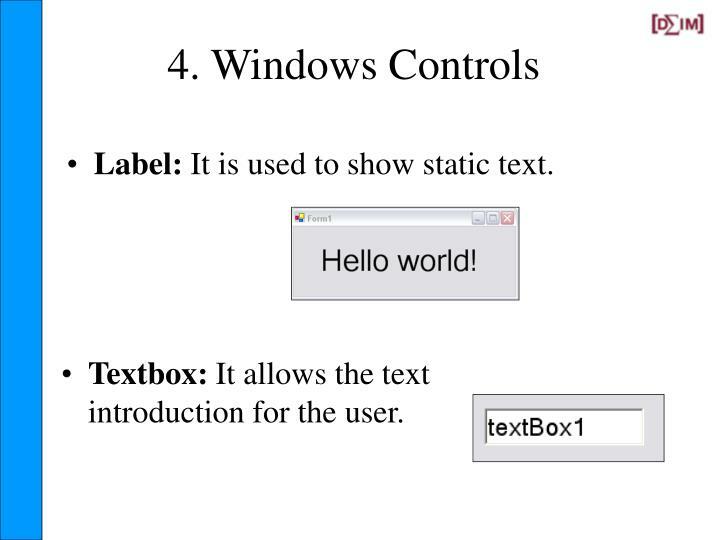 Textbox:It allows the text introduction for the user. 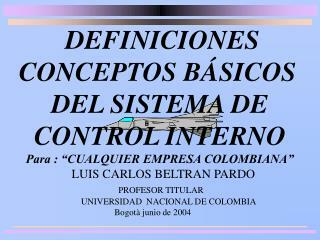 Button:control in which one can do click to carry out some action. 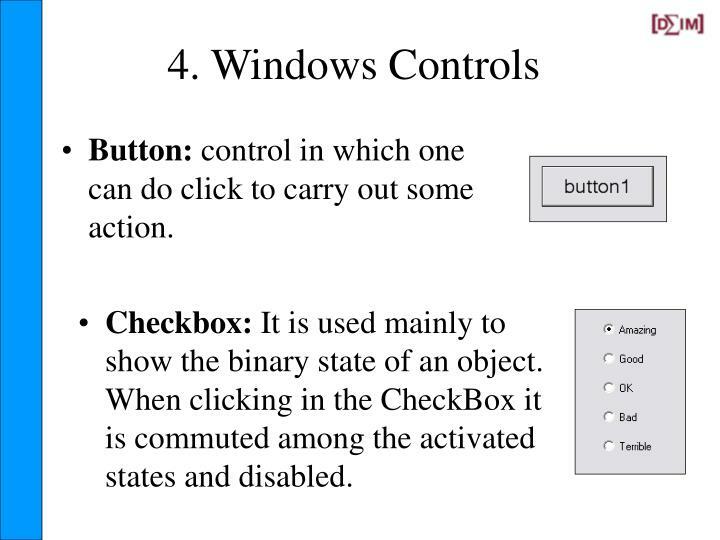 Checkbox:It is used mainly to show the binary state of an object. 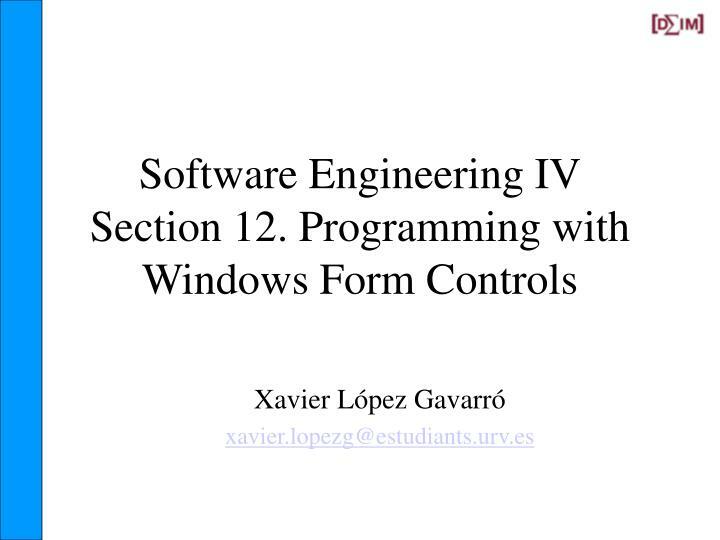 When clicking in the CheckBox it is commuted among the activated states and disabled. 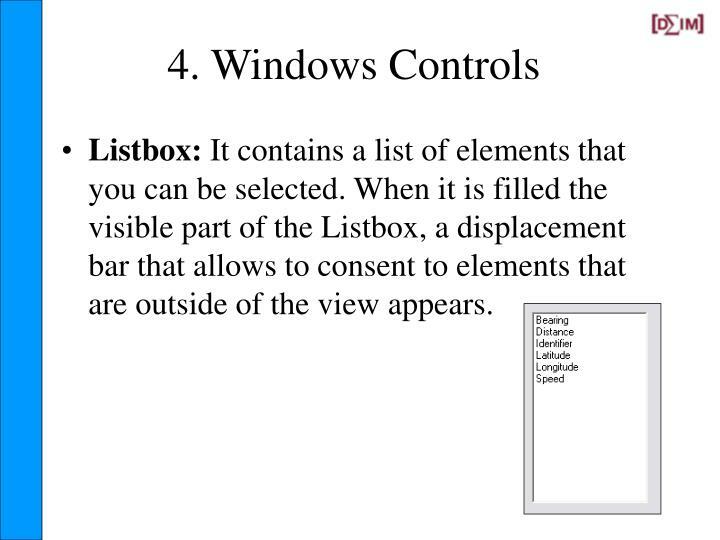 Listbox:It contains a list of elements that you can be selected. 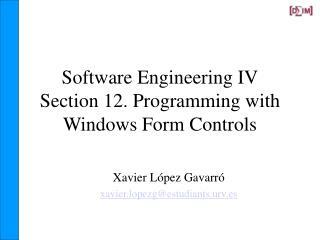 When it is filled the visible part of the Listbox, a displacement bar that allows to consent to elements that are outside of the view appears. 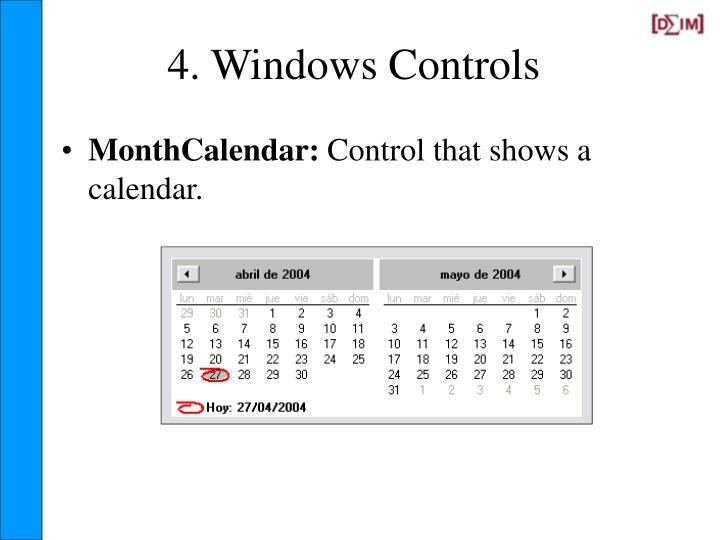 MonthCalendar:Control that shows a calendar. 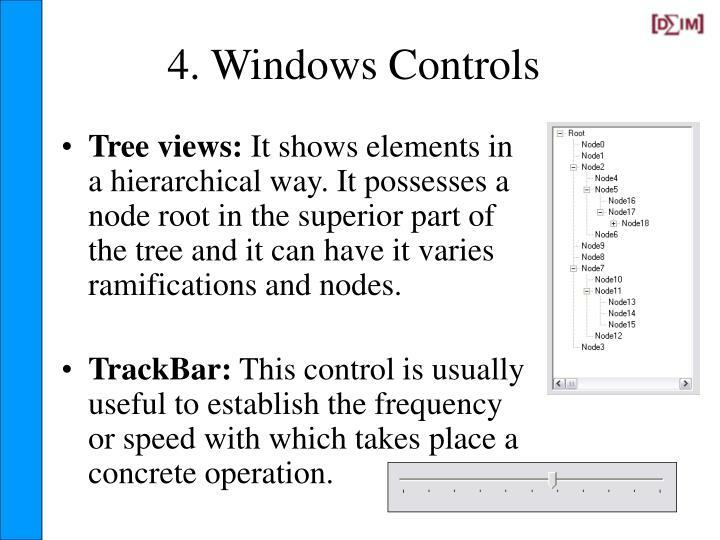 Tree views:It shows elements in a hierarchical way. 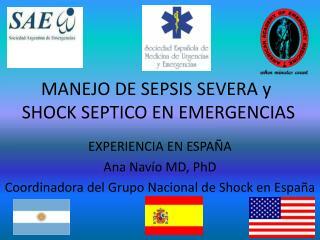 It possesses a node root in the superior part of the tree and it can have it varies ramifications and nodes. 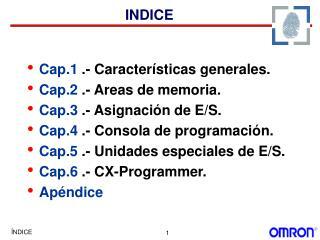 TrackBar:This control is usually useful to establish the frequency or speed with which takes place a concrete operation. 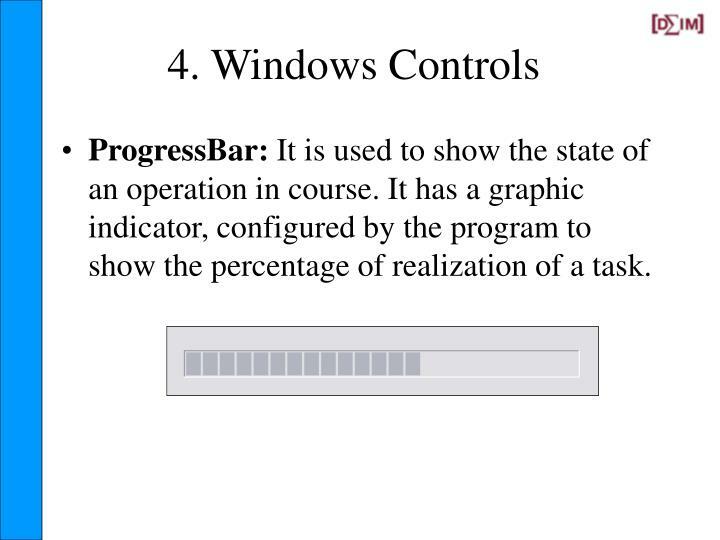 ProgressBar:It is used to show the state of an operation in course. 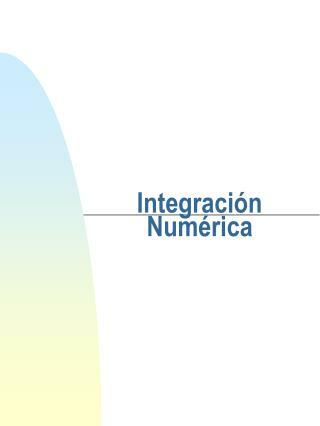 It has a graphic indicator, configured by the program to show the percentage of realization of a task. 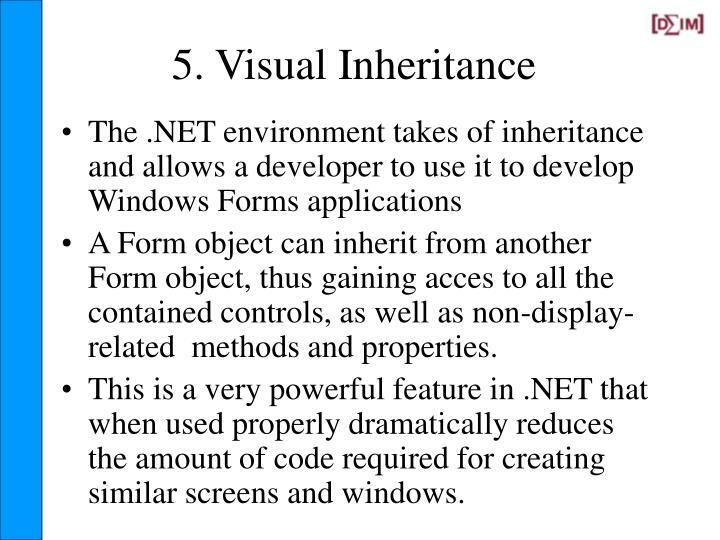 A Form object can inherit from another Form object, thus gaining acces to all the contained controls, as well as non-display-related methods and properties. This is a very powerful feature in .NET that when used properly dramatically reduces the amount of code required for creating similar screens and windows. 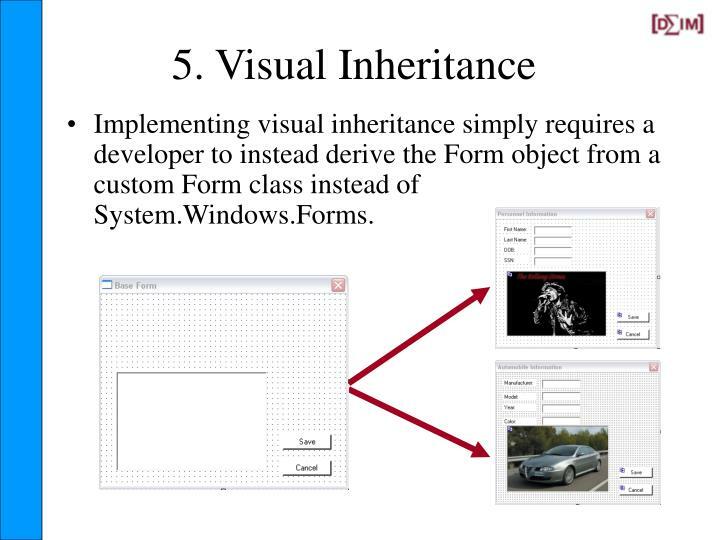 Implementing visual inheritance simply requires a developer to instead derive the Form object from a custom Form class instead of System.Windows.Forms. Winforms is quicker than Swing in Windows. 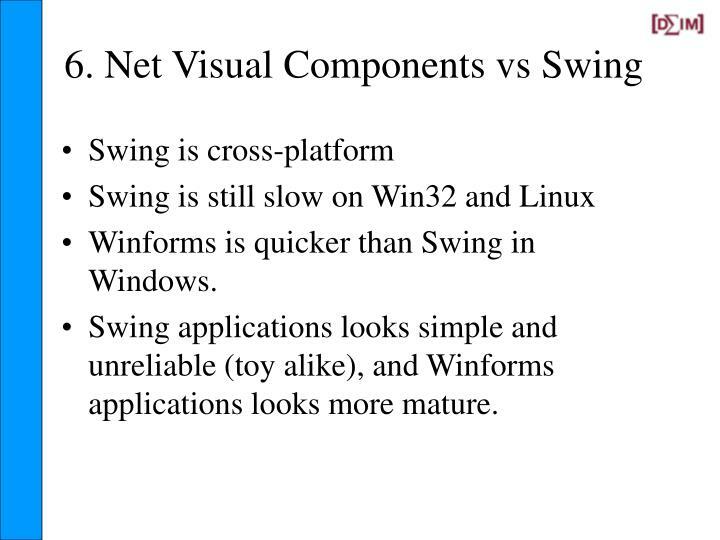 Swing applications looks simple and unreliable (toy alike), and Winforms applications looks more mature. 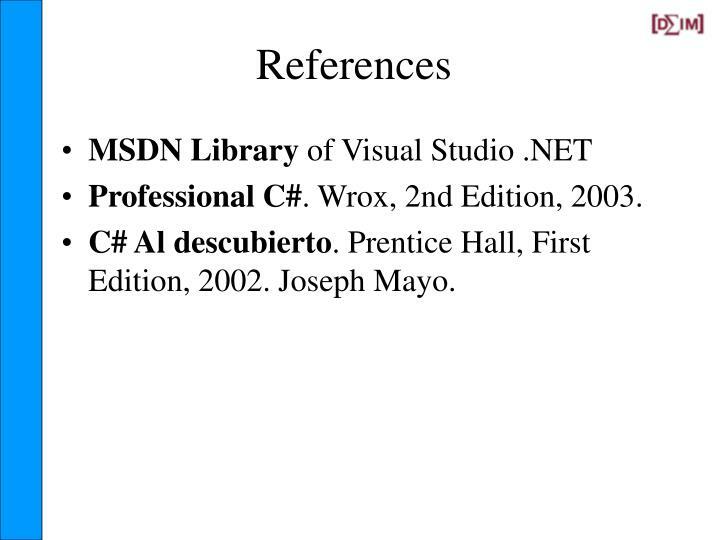 Professional C#. Wrox, 2nd Edition, 2003. 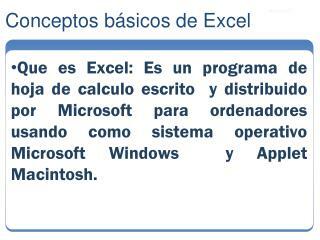 C# Al descubierto. Prentice Hall, First Edition, 2002. Joseph Mayo. 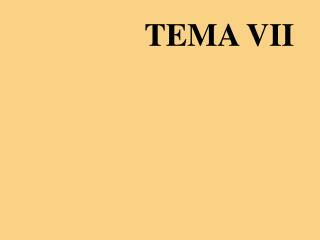 TEMA VII -. 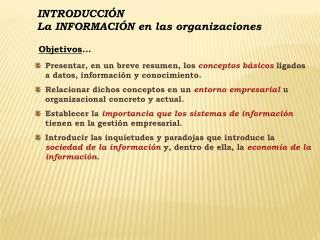 esquema general. 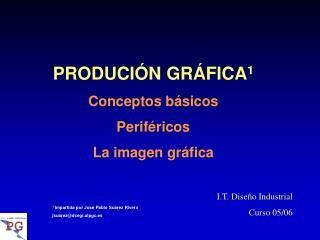 diseÑo factorial. 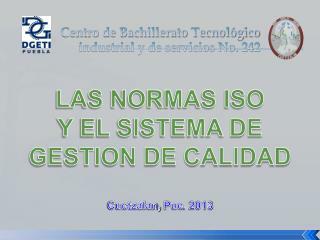 Centro de Bachillerato Tecnológico industrial y de servicios No. 242 -P u e b l a. centro de bachillerato tecnológico industrial y de servicios no. 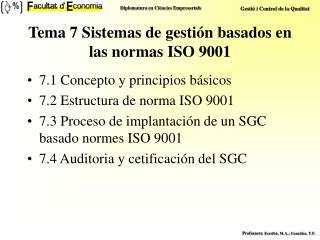 242. las normas iso y el sistema de gestion de calidad. 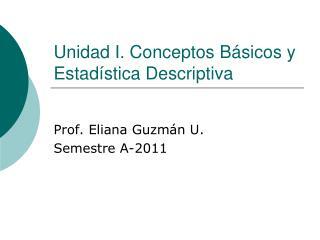 cuetzalan , pue . 2013. 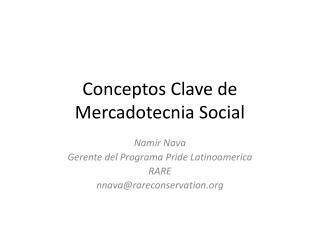 BLOQUE 1: Exámenes Clínicos -. 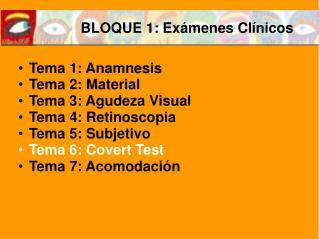 tema 1: anamnesis tema 2: material tema 3: agudeza visual tema 4: retinoscopia tema 5: subjetivo tema 6: covert test tema 7: acomodación. 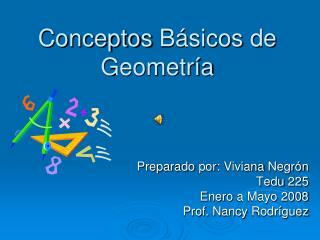 tema 6: cover test. 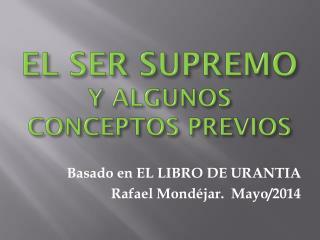 utilidad. 6. 7. 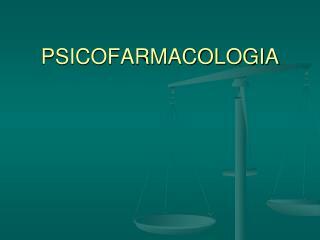 ¿qué es un estrabismo?. 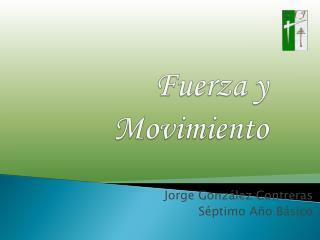 Fuerza y Movimiento -. 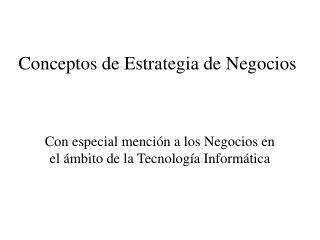 jorge gonzález contreras séptimo año básico. 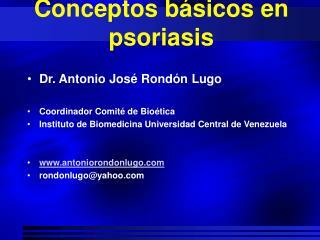 conceptos generales. fuerza. 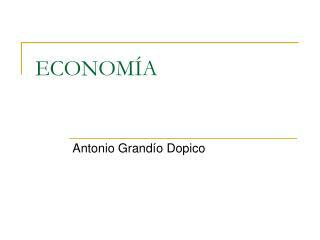 “es cualquier acción o influencia que al actuar sobre un cuerpo es capaz de cambiar el estado de movimiento de éste.”. dinamómetros.